The best concrete surface preparation material systems for the best ways to clean and prepare concrete for underlayment, overlayment, sealers and other projects. Class 1 Moisture Vapor Barrier system for the best moisture mitigation product. Material systems to help maintain and protect your concrete surfaces throughout North Carolina and South Carolina. SCR is a concentrated three-in-one concrete cleaner, degreaser, and acid concrete etcher which is a safe alternative to muriatic acid for driveways, sidewalks, pool decks, patios and interior concrete. SCR is pH Balanced and environmentally friendly. Runoff water will not harm landscape or aquatic life. 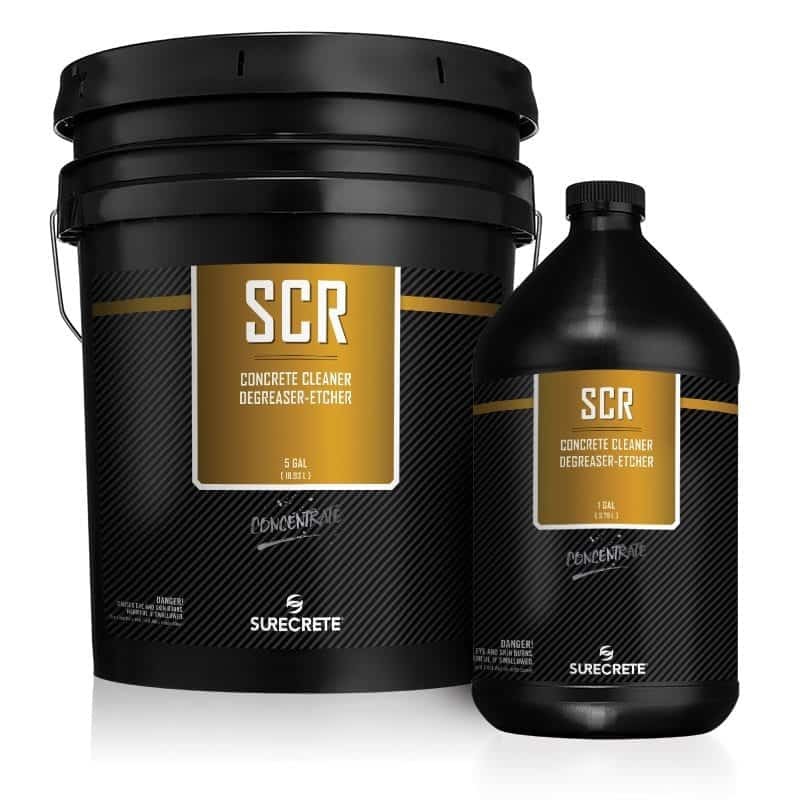 SCR Concrete Cleaner Solution quickly dissolves mortar, scale, rust, algae, stains, and mineral deposits such as efflorescence. 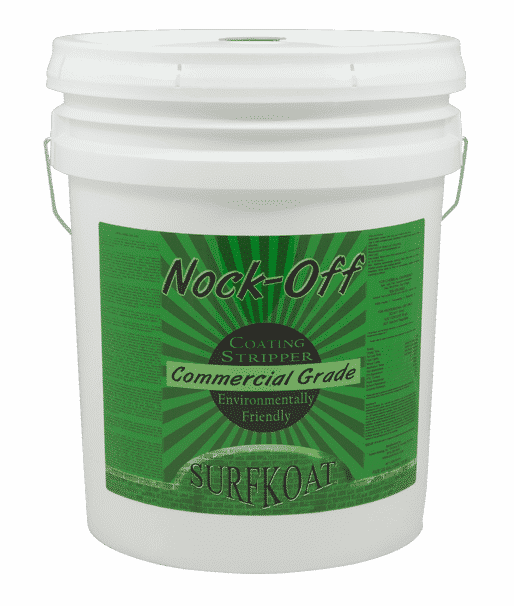 Nock-Off is a roll-on paint remover that is biodegradable, very user-friendly, and environmentally safe. It is highly effective in removing even the toughest and most durable industrial coatings such as urethanes and epoxies from surfaces like metal, wood, masonry, brick and especially concrete. 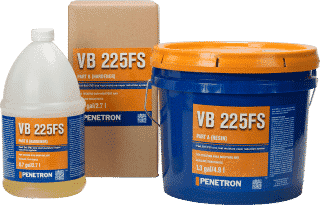 VB 225 is a one-coat moisture vapor reduction system, consisting of a unique combination of 100% solid epoxy resins and other chemical compounds. VB 225 is formulated to prevent floor failures on concrete slabs containing elevated levels of moisture vapor emission. VB 225 has no upper limits for water vapor emissions; it resists moisture levels (100% RH) and a sustained pH of 14. VB 225 is extremely dense with a perm rating of 0.05 grains/ft²/hr in Hg-¹. VB 225 exceeds ASTM F3010-13 requirements for two-component, resin-based, membrane- forming, moisture mitigation systems for use under resilient floor coverings. Crete Blast is completely biodegradable concrete de-bonding agent and remover. 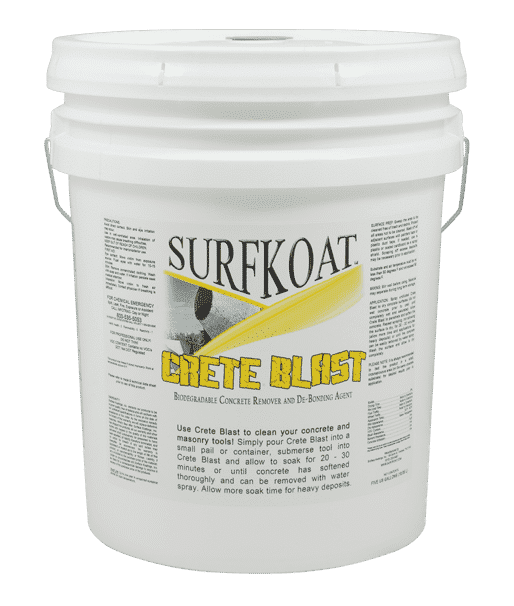 Crete Blast reverses the molecular bonding of cement and turns it back into a loose mix of slurry, sand, and aggregate that is easily rinsed away. It contains no hazardous ingredients, no VOCs that can cause harm to the environment. It’s superior cement de-bonding characteristics allow for easy removal of concrete from trucks, mixers, tools, saws, finishing machines, and much more without the high labor cost of damaging hammer and chisel work. Let us know if you would like more information on our material systems for Concrete Surface Preparation and Cleaning. Use the Contact Us page and we will respond as soon as possible. Or call us at (Charlotte) 704-333-4235 or (Raleigh) 919-794-7442. Please stop by one of our showrooms in Charlotte NC or in Raleigh NC for more product information on these material systems. Delivery is available anywhere in North Carolina and South Carolina, to Asheville, Charlotte, Greensboro, Raleigh, Fayetteville or Wilmington NC, or Columbia, Greenville, Florence or Charleston SC. SCR is a labor-saving concrete preparation system with concentrated detergents, degreaser and acids. With SCR in one fast operation you can clean, degrease and acid etch profile indoor and exterior concrete. Dilute SCR with water to control the intensity of cleaning and etching concrete. Use SCR to clean sealed concrete prior to applying new sealer in North Carolina and South Carolina. Because SCR is pH balanced there is no need to neutralize the concrete after cleaning. Highly effective on many coatings, including industrial grade products. Can save money over high cost mechanical stripping methods. VOC compliant, contains no carcinogens, does not deplete ozone. DK 700 is a Class 1 Vapor Barrier and moisture blocker for concrete floors. This moisture mitigation system is applied at 5 mils over CSP-3 concrete floors. DK 700 moisture mitigation system may be applied over concrete with RH 100 and MVER over 25 pounds/1000 sf. DK 700 may be coated with any SureCrete Design Products polyurethane or resinous epoxy floor coating system, or with a SureCrete polymer modified cement overlay product. It can also be used as a moisture blocker system under applications of VCT, linoleum, and carpeting throughout North Carolina and South Carolina. Organic complexing agent that de-constructs cementitious compounds. Contains only environmentally safe materials. Eliminates the need for expensive and damaging hammer and chisel work. Surface preparation material systems for specialty and decorative concrete throughout North Carolina and South Carolina are available at Turning Point Innovations in Charlotte NC. Formulated to treat new or existing concrete floors with moisture and/or alkaline conditions that prevent or compromise the installation of floor covering systems. May be installed on concrete with moisture vapor emissions rates over 25+ lb/24hr/1000 ft² or 100% RH. Unaffected by a pH of 14. VB 225’s low permeability of 0.05 grains/ft²/hr in Hg-¹ offers long-term protection under VCT, sheet-vinyl, wood, rubber, epoxy, polyurethane, and solid backed carpet. Can be applied on concrete slabs in offices, hospitals, schools, super-markets, manufacturing facilities, airplane hangars, residential housing, and many other applications. Low odor and fast cure allow for application in occupied buildings with minimum disruption. Pot life: Approximately 40 minutes. Immediately empty container on floor after mixing. Disposal: Dispose of in accordance with current local, state and federal regulations. Collect with absorbent material. Suggested coverage rates: Spread and mil rates are approximate and may vary due to the porosity, absorption rate and surface profile (CSP) of any given concrete substrate. Due to the disparity between the (slab) RH and the CA-CL moisture tests, there is no spread rate correlation between the two test protocols. Use the following table for approximate spread rate guidance when using only the RH test values. Product may be applied to concrete 5-7 days after placement for on-grade and below-grade applications, where concrete is placed per design, and only specified water of convenience is present. VB 225 can be applied at the rate of 125 ft²/gal at 100% RH. Proper ACI guidelines must be met for good concrete placing practices and slab vapor barriers, per ASTM E1745.